This new and provocative survey of Pop Art widens the scope of its subject while keeping the focus on the artists. With this ambitious and fascinating new book, art historian and critic Thomas Crow seeks to establish a more expansive understanding of his subject than previous histories of the Pop Art movement have managed. Locating a moment in the early '60s, when several New York City based artists independently turned towards work later understood as Pop Art, Crow observes that this turn is best explained as the result of “longer and larger historical changes” in the culture than simply a coincidental shift in aesthetic taste. 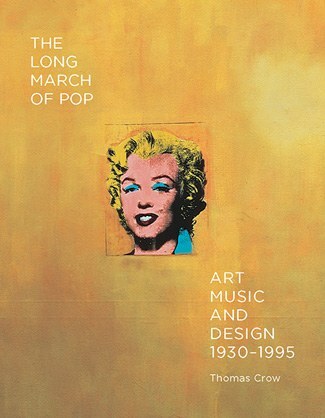 Detailing these relevant cultural processes, stretching back to the '20s and forward to the '90s, which informed Pop Art and in turn is informed by Pop Art, with The Long March of Pop, Crow produces an art history and a cultural history, told with nuance and precision and of interest not just to enthusiasts of the fine arts. Pop Art is recognized as a specific movement within the disciplines of fine art, generally determined as lasting from the mid-'50s through the '60s. Crow prefers a simpler term, Pop, to signify a more inclusive understanding. That is, through Pop the tension between so-called High culture and Low culture dissolves in favour of a more sympathetic and associative dialectic. Crow writes: “The best Pop regularly finds its themes and subjects in minority enclaves of every day cultural expression, subcultures where standards of expertise and aesthetic refinement are fully the equal of anything available in the fine-art sector.” Thereby, throughout the book the Pop Art canon is considered and understood alongside knowing and relevant discussion of such disparate phenomenon as rock posters, Che graphics, Godard films, surf boards, John Kane’s paintings, and the Anthology of American Folk Music. Within this wider macrocosm, the book features concentrated discussions of many of the recognized Pop artists and relevant facets of their work and careers. Robert Rauschenberg, Jaspar Johns, Roy Lichtenstein, Robert Indiana, and James Rosenquist all receive fascinating appraisals. Moving on from the lofts and galleries of New York, several chapters alight to the dispersed byways of Los Angeles, where surfing and car cultures produced objects reflecting high “standards of expertise and aesthetic refinement” influential to artists there. By carefully describing the antecedents and situating them within a well-defined context, Crow offers the reader a fresh experience in considering the work of these artists. To this end, most of the works discussed are represented with crisp full-color reproductions, many full-page. The direction of these chapters culminates with a provocative appraisal of Andy Warhol’s signature portrait work, beginning with his Marilyn (1962). This new consideration of Warhol is presented in conjunction with his NYC, foil Bob Dylan’s own turn to Pop in 1965, and culminates in something of an epiphany regarding pop culture, Pop at large, and the real dimensions of Folk .This argument was seeded in the preceding chapters, but still arrives as something as a surprise and hints at reconsiderations of cultural processes going back centuries. That’s good writing, and Crow has really set a new bar here for art history and criticism.